Navy and Coast Guard Cooperate for Future Fleets The U.S. Navy and Coast Guard are working closely together to meet their respective operational challenges while developing their future fleets. 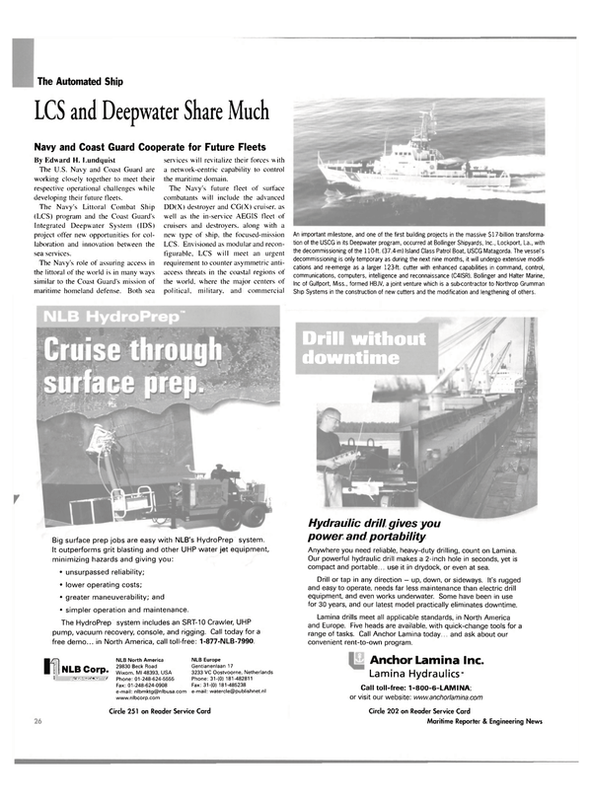 The Navy's Littoral Combat Ship (LCS) program and the Coast Guard's Integrated Deepwater System (IDS) project offer new opportunities for collaboration and innovation between the sea services. The Navy's role of assuring access in the littoral of the world is in many ways similar to the Coast Guard's mission of maritime homeland defense. Both sea services will revitalize their forces with a network-centric capability to control the maritime domain. The Navy's future fleet of surface combatants will include the advanced DD(X) destroyer and CG(X) cruiser, as well as the in-service AEGIS fleet of cruisers and destroyers, along with a new type of ship, the focused-mission LCS. Envisioned as modular and reconfigurable, LCS will meet an urgent requirement to counter asymmetric antiaccess threats in the coastal regions of the world, where the major centers of political, military, and commercial power are found. LCS will help to assure timely access for U.S., joint and coalition forces in the littoral against three main threats; small, fast surface craft, quiet submarines, and numerous and relatively inexpensive mines. With "spiral development," the LCS modules will continuously deliver a potent stateof- the-art combat capability throughout the ship's life. The Coast Guard established the Deepwater Project in 1996 to replace its aging and overworked open-ocean forces. The service is typically called upon to operate far out to sea on a continuous basis for months at a time in extreme conditions. There is a critical need to replace its obsolete assortment of cutters and aircraft with modern platforms, sensors, real-time command, control, and communication network connectivity. Deepwater forces will be fully interoperable with the Navy and other services, as well as federal, state, and local law-enforcement partners, including elements of the new Department of Homeland Security, together providing a layered defense of the United States. LCS and Deepwater assets will be part of a force that is netted together. The assets will share and exploit sensor data with the other platforms with which they operate. The LCS attributes of high speed, shallow-draft, small radar cross-section, and "net-centricity," can be leveraged by the Deepwater program as they are directly applicable to counter-drug operations, migrant interdiction, fisheries enforcement, maritime homeland security and other Coast Guard missions. Both LCS and Deepwater ships will rely upon manned and unmanned aerial, surface, and underwater vehicles. Both will have flight decks for manned and unmanned rotary-wing aircraft. Both will be configured for the rapid launch and recovery of boats, as well as unmanned underwater vehicles and unmanned surface vehicles on LCS. The LCS and Deepwater sharing of technologies and systems even includes the seeking of a common "sea frame" design (although the result may not be a common ship). The sea services can leverage resources to synchronize research and development, planning, budgeting, procurement, development of doctrine and operational procedures, training, and execution of operations. This cooperative effort can reduce development costs, while also increasing the attractiveness of these ships and systems to potential foreign buyers. Edward Lundquist is a communication director for Anteon Corporation's Center for Security Strategies and Operations.